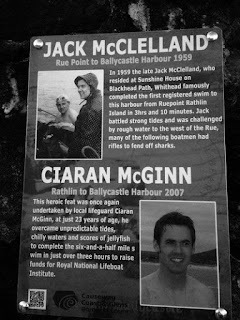 Jack McClelland was a leading Irish marathon swimmer during the mid 1950's to late 1960's. Swimming was just one of his talents; he also turned down a professional football contract with Arsenal, was a weightlifter, and worked as a professional wrestler under the alias J Raymond the Belfast Bulldog. His greatest swim was arguably his victory in the 1956 Butlin's Cross Channel Race. He was joint winner with International Marathon Swimming Hall of Fame Honour Swimmer Tom Park in 11 hours. Due to poor conditions in the English Channel, all the swimmers were pulled and the two swimmers who swam furthest won. McClelland competed in the 1957 Butlin's Cross Channel Race when the conditions were terrible and only two swimmers finished with Greta Andersen finishing in 13 hours 53 minutes over England's Ken Wray in 16 hours. 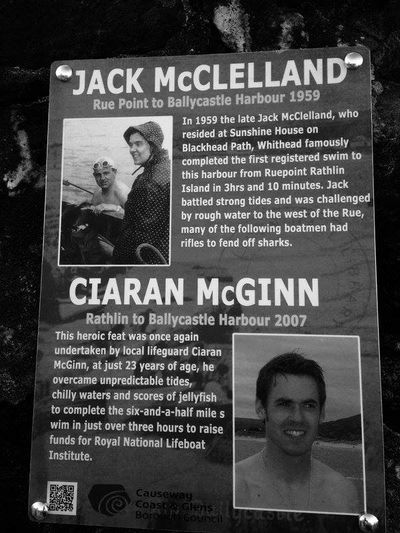 He also completed a number of pioneering unprecedented swims between 1958 and 1959: Carrick to Bangor (1958), Lough Neagh (1959 in under 18 hours following Commander Gerald Forsberg as the second successful swimmer), Rathlin Sound (1959 from Rue to Ballycastle in 3 hours 10 minutes as the first man), Strait of Gibraltar (1961 as the first Irish swimmer), Galway Bay (1964, Blackhead Clare to Salthill Galway in 7 hours), Tory Island to mainland (1968), Blaskets Island to Dunquin (1969), and Tralee Bay. His great disappointments included never completing an English Channel crossing or a North Channel crossing, although he had a headline-grabbing attempt in 1959. He later helped promoted marathon swimming as the President of the Irish Long Distance Swimming Association from 1979 to 1984 and obtained the sponsorship required in 1979 for a relay swim to the Isle of Mann to celebrate the 1,000th year of unbroken parliamentary rule. The Northern Ireland Screen Digital Film Archive has a fascinating short film about McClelland's swim from Rathlin Island to Ballycastle posted here. Note: on January 5th 2018, he was inducted in the inaugural Class of 2018 in the Hall of Fame - Marathon Swimming Ireland.